Alpha Isolate Lean Review | Buy or a Scam? For supplement manufacturers, one of the most important elements of a protein shake to get right is the flavour; if the product tastes great, customers will repurchase the protein powder time and again. 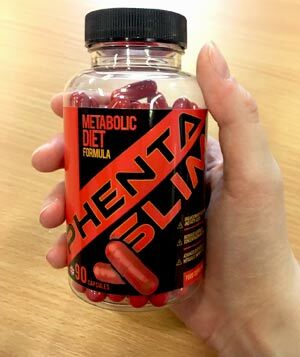 Unfortunately, there are lots of customer complaints about the taste of Alpha Isolate Lean, which may have played a role in the product being discontinued. Below we take an in-depth look at Alpha Isolate Lean, to see what benefits it offers consumers. 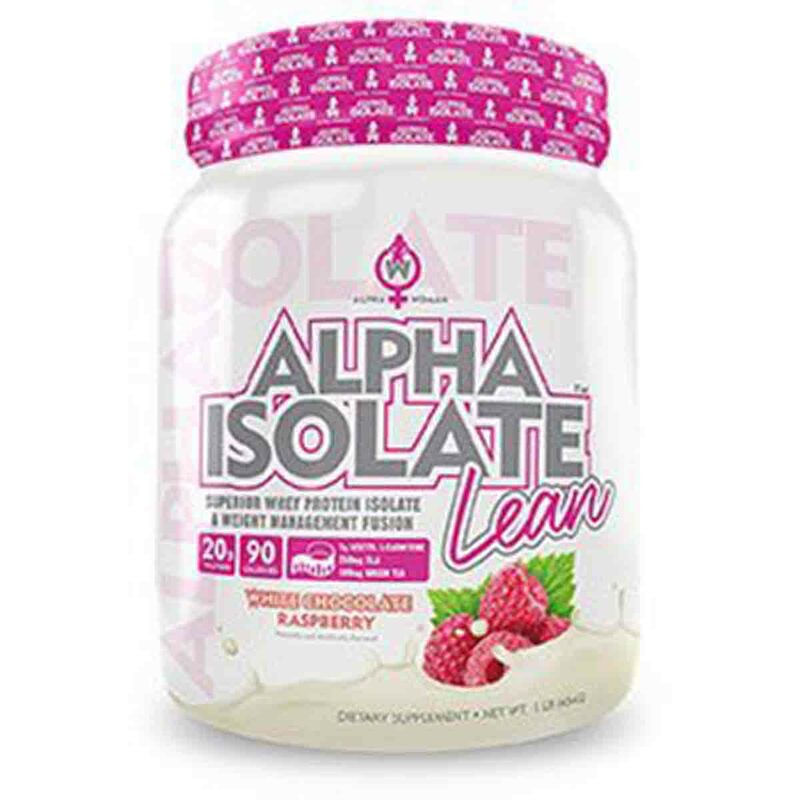 Alpha Isolate Lean is a protein shake that combines “superior whey protein isolate” with three weight management ingredients, Conjugated Linoleic Acid (CLA), Green Tea Extract, and L-Carnitine. The product comes in white chocolate raspberry flavour and each tub contains 1lb of the powder, which provides 16 servings. What Are The Side Effects Of Alpha Isolate Lean? Looking at the available customer reviews, it appears that side effects are a relatively uncommon experience (with most of the negative reviews mentioning the poor taste only). There are a few reports of side effects including headaches, migraines, and bloating, but remember that these are definitely in the minority. For more information about the side effects that could be caused by the ingredients in Alpha Isolate Lean, click on the Side Effects tab below. How Much Does Alpha Isolate Lean Cost? Alpha Isolate Lean is currently only available from healthyandbeauty.co, where a single 1lb tub costs $20.82. Delivery charges may also apply. The product appears to have been discontinued and stock may be limited. 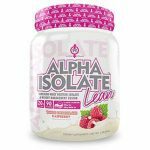 Alpha Isolate Lean provides a good serving of 20 grams of protein, but the product has numerous issues. The biggest issue is probably the taste and smell, with lots of customers describing it as awful and fishy. There are also numerous complaints about the mixability of the powder, which seemingly takes longer to dissolve than similar protein powders. Each tub contains just 16 servings, and larger tubs are not available. There are some ingredients that have been added to this protein powder to assist with weight management. However, we believe that the doses used are far too small to contribute to the consumer’s weight loss efforts. The product is not covered by a money-back guarantee, but is covered by a 30-day limited returns policy by a third party retailer. The price appears to have been reduced to get rid of stock; in the past, a tub cost over $30, and now retails for around $20. Overall, we do not recommend Alpha Isolate Lean to our readers. Alpha Isolate Lean is a protein shake that combines “superior whey protein isolate” with a selection of weight management ingredients. The product comes in white chocolate raspberry flavour. Customers appear to be divided on the flavour; many have noted that the product smells fishy, and others disliked the flavour completely. However, some people love the flavour, and state that it tastes exactly like white chocolate raspberry. Several reviews have stated that the product smelt horrible but tasted great. Mix one scoop with 8oz of water or milk as desired. Can be used as a meal replacement shake, a snack, or after a workout. Alpha Isolate Lean is manufactured by Alpha Woman Supplements, who appear to be the relatively new sister company of Modern Man Nutrition (who sell a similar protein shake called Alpha Isolate). The company can be contacted using the information provided on their official website, or through Amazon, where their products are sold. The company are based in Florida in the USA, but a more specific address is not provided. What Does Alpha Isolate Lean Claim To Do? According to the manufacturers of Alpha Isolate Lean, the protein powder combines high-quality whey protein isolate with an “innovative weight loss blend” of Acetyl L-Carnitine, CLA, and Green Tea Extract. The product is designed to encourage fat loss and support the growth and maintenance of lean muscle mass. Does Alpha Isolate Lean Work? Each serving of Alpha Isolate Lean contains 20 grams of protein, which is a relatively good amount for a protein shake. Alpha Isolate Lean can be used as a meal replacement shake to aid weight loss, or can be used as a source of easily digestible protein after a workout to help promote lean muscle mass growth. CLA could potentially have a small effect upon the body, somewhat reducing fat mass and aiding muscle growth in consumers who are exercising regularly in order to build muscle. There is also the worry that it is an unreliable or unpredictable supplement. One review paper that pooled the results of 18 studies of CLA found that, on average, CLA caused ‘modest’ fat loss. Other studies describe it as a relatively poor and unreliable fat burner. Recommended dosages of CLA vary between around 3200 mg and 6400 mg per day, meaning that the 250 mg per serving found in Alpha Isolate Lean is definitely inadequate and unlikely to have any impact at all. Similarly, the amount of green tea extract in this supplement is unlikely to increase thermogenesis very much, and is therefore unlikely to aid weight loss either. It seems unlikely that the added ingredients in this protein powder will speed up weight loss much, if at all. What Are The Ingredients of Alpha Isolate Lean? The ingredients found in Alpha Isolate Lean are detailed below. The ingredient quantities listed are per serving of one scoop. A single scoop mixed with water contains 90 calories, 20 grams of protein, 2 grams of carbohydrate, and 1 gram of fat. It does not appear to contain any fibre. Does Alpha Isolate Lean Have Any Side Effects? Protein shakes do not generally come with too many side effects. Overuse of whey protein shakes can sometimes cause increased bowel movements, thirst, bloating, nausea, cramps, reduced appetite, fatigue and headaches. Those suffering from kidney issues or those that require prescription medication should check with their doctor before trying out protein shakes, as the increased protein intake could cause issues. There are some additional ingredients in this supplement as well, which have the potential to cause some side effects. Green tea can cause constipation. L-carnitine is generally thought to be safe for use, although it can occasionally cause stomach problems, vomiting, heartburn, diarrhoea, seizures, and a fishy odour from the urine, sweat, and breath. The presence of Carnitine may explain the fishy smell that lots of reviewers mention. CLA can cause stomach upset, diarrhoea, nausea, and fatigue. CLA can also increase triglyceride levels in some cases, sometimes sharply. High triglyceride levels can cause fatty liver disease and pancreatitis, and having high triglyceride levels are thought to increase your risk of heart disease. If you already have high triglyceride levels, you should not take this supplement. Not suitable for pregnant or breastfeeding women. Not suitable for anyone under the age of 18. If you are unsure about the suitability of this supplement for you, consult your doctor before purchase. Not suitable for people who have high triglyceride levels. Are There Any Customer Reviews For Alpha Isolate Lean? There are hundreds of customer reviews for Alpha Isolate Lean on Amazon. Alright, the first thing you notice with this product is the smell. GOODNESS, I was so taken back by the fishy smell when I first opened the package, I was afraid to try it. I had to deduct a star because of the smell. However, once mixed, the shake is not bad at all. I actually like the taste. I’m getting into the routine of replacing one of my meals a day with a shake. This one is packed with protein. It is sweet so if you don’t like sweets, this will probably not work for you. I mix one scoop of the powder with ice, almond milk and water. Once you get over the smell, you’ll be fine. I just started it this week so not weight loss yet. Great benefits, awful taste. For what you would want in a protein powder, this one is great. I really feel like it benefits me. However, I HATE the taste. I mix mine with almond milk and just gulp it down because it’s awful to me. It’s not the typical I hate protein taste. I just think it’s too sweet and a bad flavor combo choice. I wish they would make something more neutral like vanilla or chocolate. I don’t really like the taste. However, it makes me feel full, and I was able to skip a lot of snacks and desserts. Does Alpha Isolate Lean Offer a Money-Back Guarantee? Alpha Woman Supplements do not offer a money-back guarantee, and do not even provide a clear returns policy on their official website. The product is currently only available from Healthandbeauty.co, who have a 30-day returns policy that covers unopened and unused products only. Where Can I Buy Alpha Isolate Lean? At the time of writing, Alpha Isolate Lean was listed as out of stock on Amazon, and was no longer listed on the official Alpha Woman Supplements website. The website merely states that they are launching a protein shake “soon”. It is possible that the product has been discontinued, and will be increasingly harder to find in the future. The only remaining retailer that sells this supplement is healthyandbeauty.co, who sell a single 1lb tub for $20.82. They have a stock counter on the website, and reportedly have 994 left in stock; whilst still might sound like a lot, we should stress that this appears to be the only place to get Alpha Isolate Lean, and stock is limited. How does Alpha Isolate Lean compare to Phentaslim? The Diet Pills Watchdog does not recommend Alpha Isolate Lean.